Has animosity between two Brit giants ended? 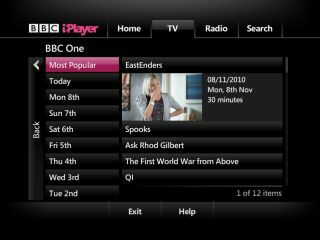 BT Vision will soon have the BBC iPlayer, with two of the biggest British brands announcing a deal to bring the catch up TV service to the IPTV platform. BT and the BBC are already working closely on the forthcoming YouView, and the two will now collaborate on iPlayer for the former's BT Vision television over internet platform. The iPlayer will be introduced 'over the next five months' with roll-out beginning in December and all customers granted access by April 2011. The BBC-branded application will be accessed through the programme menu and is the full iPlayer package – offering 'almost all' of the television and radio programmes available on the online iPlayer. Daniel Danker, BBC General Manager for Programmes and On Demand, said: "October was a record month for BBC iPlayer with a total of 139 million programme requests on computers, TVs and mobiles. "Over 20 million of those requests were delivered to TVs. Licence-fee payers love the option of enjoying BBC iPlayer's high-quality experience and vast choice of programmes on the living-room TV, and we're delighted to be able to bring the service to BT Vision." The move is a significant one given the history between the two – with BT the biggest critic of the strain that video applications like the iPlayer put on its network and, at one stage, traffic managing connections to the online player. Marc Watson, chief executive of television and online services, BT Retail, said: "We are really excited to be partnering with the BBC to bring the BBC iPlayer service to BT Vision customers. "The launch of BBC iPlayer on BT Vision adds to the vast range of quality entertainment already available to our customers."